This is a follow up to my article on Carbon Capture and Storage from Monday, consider it the epilogue or post script. I was researching on the Bakken Shale when I had one of those face palm moments. 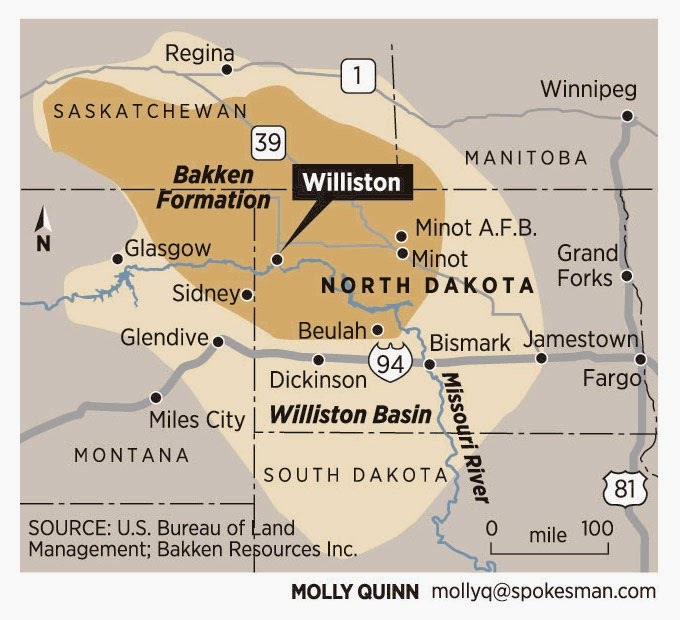 The Bakken is a massive reservoir of oil that stretches from Southern Alberta across Saskatchewan and Manitoba in Canada to North Dakota, Wyoming, Idaho, and Montana. The geology and geography of the regions are similar, the southern prairies in Canada are badlands, arid desert areas from the Rockies to the Dakotas. These are prehistoric regions whose ancient face is for all to see, hoodoos which contain fossils, and thousand year old painting on stone indigenous art, an area that once held oceans, until what is the Pacific Northwest crashed into North America creating the Rockies and folding the earth under the prairies. The Northern parts of the US states affected are a similar geological and geographic formation. 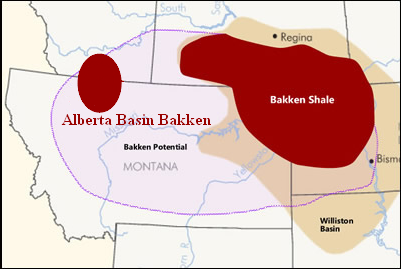 The map below shows the extent of the Bakken, the area outlined is the potential Bakken field, the Shale is that area in Saskatchewan yet to be developed, while it is being rapidly developed in North Dakota., There is also an Alberta Bakken field which is awaiting development as much as the field in Saskatchewan is. Last week Saskatchewan Power announced it was about to put the first North American carbon capture and storage (sequestration is such a mouthful) unit online at its coal fired power plant in the middle of the Bakken Shale. production of this bituminous oil, a form of oil not much different from its oilsands counterpart in Northern Alberta and Saskatchewan. While we know that CO2 Capture and Storage is used for Enhanced Oil Production (EOP) in old wells, it makes sense for Sask Power to look at getting its final product into the Bakken fields. It has less bad press than other forms of Fracking have. And don't be fooled by the name CCS as it is known, full title being CCS for EOP. In this case it would be fracking with CO2 in the Bakken to get the oil out. With man made CO2 the cost for injection would go down, so that the Bakken becomes easier to access with fracking by carbon dioxide, then with other methods. SaskPower was a sponsoring partner in the IEAGHG Weyburn-Midale CO2 Monitoring and Storage Project for more than ten years. This research program, which began in 2000 and was completed in 2012, sought to measure, monitor and verify the CO2 being injected into two depleted oil reservoirs in southeastern Saskatchewan. Cenovus Energy (at the initial time of injection PanCanadian and later EnCana) began injecting CO2 into the Weyburn Reservoir in 2000 to enhance oil production, and Apache Canada began injecting into the Midale Reservoir in 2005. Both operations have ensured that the injected CO2 has been kept in place; any recycled amounts that come up with the oil are re-injected along with the 8000 tonnes of new CO2 that arrive daily from the Dakota Gasification Company’s coal gasification plant in North Dakota. Since 2000, some 22 million tonnes of CO2 have been successfully stored underground in these two reservoirs; the research program has successfully demonstrated that the CO2 remains safely underground, and in 2012 provided a publicly available Best Practices Manual to assist other jurisdictions and companies thinking of storing CO2 in similar formations. "Fueled by advancements in horizontal drilling and hydraulic fracturing, the United States has surged past Russia and Saudi Arabia to become the number one oil- and gas-producing country in the world. And perhaps nowhere is this energy revolution more striking than in the dusty North Dakota boomtowns, popularly dubbed 'Kuwait on the Prairie.'" Hopefully this new Carbon Capture and Storage unit really makes a difference to our numbers. We really need to work together to save the environment.